How do you choose a WordPress host? If you’re just hearing about WordPress, it’s likely that one of the first questions you face is how to select a hosting provider. Where you host WordPress will have an impact on your site’s performance, as well as your wallet. And these days you have more options than ever. Let’s start by saying that, like with everything else, there is no single perfect answer. 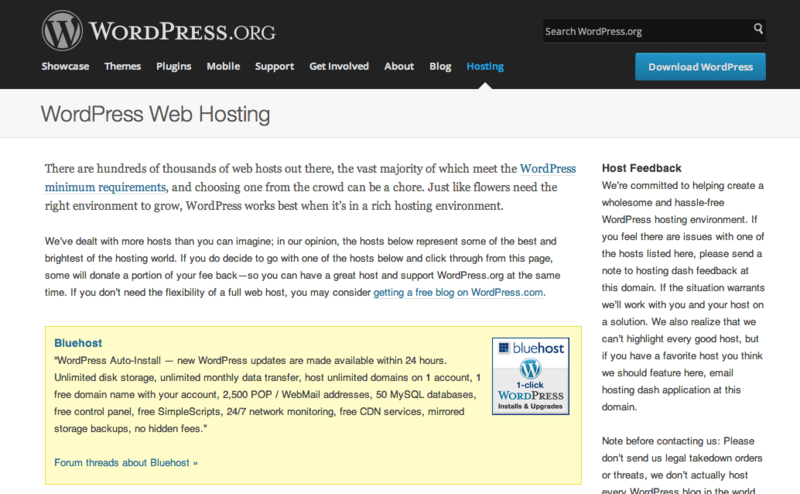 Even if the WordPress.org website makes it sound like Bluehost is “the best and brightest” of the hosting world, all you need to do is spend a little time on Google to find out that there’s a lot of people that disagree with that sentiment. On the flip side, you’ll read posts by others stating that the only way to go is with a managed WordPress hosting provider – like WP Engine, Pressable, Pagely, or Synthesis. Then there are the low cost providers like GoDaddy, offering solutions at really inexpensive prices. And don’t forget the folks right in the middle, like MediaTemple, DreamHost, and SiteGround. And once you realize that, you’ll discover why there’s no single perfect answer. Just like there’s no perfect answer for everyone. There’s also another factor you should know right now. Right off the bat, because if you start comparing on this one aspect, you’ll be in for a lot of disappointment later. Every. Single. Host. Will. Have. Downtime. There’s no getting around it. If someone tells you that they’ve never had their site go down in 10 years, it’s more likely they weren’t paying attention. After all, if your site has low traffic and you don’t have an uptime monitor in place, there’s no way you’ll know you experienced downtime. But everyone experiences downtime. Everyone. So let’s just assume that if you do all your research and select a provider, you should still be prepared for some small amount of downtime. And if you’ve led a bad life, it will likely go down right when you need it up (just kidding). So now that the playing field is level, let’s talk about some of the things you should consider. If you’re a developer, you care about things that others may never need to think about – like Git integration. If that’s you, then looking at SiteGround or WP Engine may be right for you. You may also care about a staging environment, which means you would add someone like Pressable to your list of candidates. All three providers, SiteGround, WP Engine and Pressable also do automated backups so you never have to worry about rolling back in the crazy case that you decided to edit something directly on a server. But if you’re not a developer, at least two of the three factors listed above mean nothing to you, and you might look at other options. Are you hosting an eCommerce site? Nine out of ten times, the people I talk to about eCommerce sites have only vaguely heard about PCI compliance. In and of itself, that’s a scary thing. But here’s the reality – PCI compliance checks fail more often because of things that are driven by your hosting provider than they are the software you’ve installed. It’s true that you could screw up PCI compliance on your own by picking the wrong combination of WordPress plugins, payment gateways and settings and configurations. But it’s a lot harder to screw that up, than it is to simply make the wrong choice about your hosting provider. There’s a way around dealing with PCI compliance on your own server – by pushing most of it to a gateway, but if you’re looking for a WordPress host that offers a fully PCI compliant solution, then you’re going to notice very few players stepping into that space. Check out the Geek plan at SiteGround. And if you’re running a large eCommerce site, with a lot of traffic, Pagely can create a PCI compliant solution for you – but it will cost you. This stuff isn’t easy or cheap. Are you a popular author or blogger? Now, notice I asked about your level of popularity. Because the suggestion I’m going to make here isn’t for folks that get a few thousand pageviews a month. You’d not be likely to pay almost $30/month either. But if you’re focused on writing and hoping someone else will focus on hosting, then you’d likely want to give Synthesis a shot. If you don’t know about Synthesis, just know it’s from the CopyBlogger folks – you know, the kinds of content marketing. And the folks that brought you the Genesis Framework. More importantly, this managed hosting provider also includes Scribe – normally something you’d spend almost $100/month on to help you with your keyword research, writing, and post optimization. But with a Synthesis account, you get all the benefits of a managed host where they take care of your WordPress deployment, as well as the benefits of Scribe, to help you write better. Are you smart enough to be dangerous? Look, I know you raise your eyebrows if I mention a $30/month hosting plan. It’s not for everyone. Especially not you if you know a decent amount about WordPress. In that case, you can do stuff on your own, right? After all, you have a copy of BackupBuddy and with Sync, you can get crazy. Or maybe you’re using ManageWP or InfiniteWP to manage a bunch of sites. In that case, you just want to make sure you have a reliable partner who will support what you’re doing. The author of that post (Ryan) must have realized I was about to do a comparison on hosting providers and delivered his masterpiece first. If you haven’t read it, check it out. I’ll wait. Would you like someone to take care of everything for you? I actually have accounts at every one of these managed hosting providers. If I get a chance to beat Ryan to the punch, I’ll compare their performances. But what you should know, even in this list, is that they differ widely in culture, approach, support and cost. Since you’re picking a provider because you don’t want to do anything, and you hope they’ll do it all for you, it makes sense that you’ll want someone you feel “good” connecting with. That’s why I recommend you get some of these folks on the phone and see how they do answering your questions. Find one that feels good to you and give them a shot. Alternatively, you might consider one of the providers in the list right above (SiteGround, Site5 and DreamHost) and add some maintenance services. Are you looking to collaborate on site development? Until recently, this wasn’t even a category I ever thought of. But the truth is that larger projects require more people (and often distributed teams) and more collaboration. To that end, a solution that makes it easy to collaborate is worth thinking about. And the folks at Pressable and Flywheel have worked specifically to create those kinds of solutions. Flywheel goes even further, not charging you for sites that are in development and making it easy to deliver the site to a client so that they can start paying the host directly. So how do you choose a WordPress host? I started by telling you that there’s no perfect answer. And that’s true. But it’s also not correct. It’s true that globally there’s no perfect answer. But for you, just you, there may actually be a perfect answer. It depends on what you’re doing. It depends on how much you want to do. It depends on how much you want to spend. But in the end, you can find the perfect WordPress hosting partner. And partner is the key term there. Because there will be downtime. And there will be moments when their tech support doesn’t live up to your expectations. But the truth is, we all have those moments. Moments when we’re not at our best. And so with a little grace and mercy, you can find and form a partnership with your hosting provider so that your site can succeed over time. I know there are companies that I missed. Or that I didn’t cover (on purpose). I know my answers may not match yours. But they are my answers. And they’re my attempt to impartially help you. Share with me, and everyone else, your experiences.